A new Trump decree will eliminate DACA (Deferred Action for Childhood Arrivals). DACA was established by the Obama administration to provide work authorization and deferral of deportation to young people who came to the US while under the age of 16, and who have graduated from high school, attended college, are currently attending school or have served honorably in the U.S. military. This new edict abolishes the DACA program, although it allows current beneficiaries of DACA to continue working until their current two-year work authorization expires. Thus, it abolishes any new applications for DACA as well as any extensions. From the wording of the edict, it appears that those unfortunates with pending applications will be denied. It also allows US ICE (Immigration and Customs Enforcement) to initiate removal proceedings against dreamers, although it allows ICE to exercise prosecutorial discretion to decide on a case-by-case basis not to deport individual dreamers who already have work authorization. It also eliminates DAPA, which provided for deferred action for the parents of U.S. citizens and lawful permanent residents, but which never went into effect because of the injunction in the Texas v. US litigation. Louis XIV “L e’tat c’est moi”​ illustration for La France et Les Francais a Travers les Siecles, F.Roy 1890. A proposed executive order, really a new edict by President Trump, lists the following targets of sweeping reforms: B-1 business visitors; F-1 practical training; E-2 treaty investors; H-1B temporary professionals; H-2A temporary agricultural workers; J-1 supper work travel program; L-1 intracompany transferees; and E-verify. DHS (Department of Homeland Security) is to review all regulations allowing foreign nationals to work in the US, and to determine which of them should be rescinded within the next 90 days. DHS is to start making site visits to the places of employment of L-1 workers, as well as third-party client sites, and develop a plan to expand the site-visit program within two years to cover all employment-based visa programs. Within 90 days, DHS is to come up with a plan to expand employers’ participation in E-Verify and to require employers to participate in E-Verify if they are sponsoring a foreign national. The proposal also states that “The heads of all executive departments and agencies shall rescind any orders, rules, regulations, guidelines, or policies implementing or enforcing the programs rescinded by this order, in the manner and to the extent consistent with law”. The proposed edict would also abolish the use of parole for entire groups of people. Regarding the executive order, “Protecting the Nation from Foreign Terrorist Entry into the U.S.”, Department of Homeland Security has now clarified that it will allow lawful permanent residents and dual nationals who are US citizens to enter the U.S. However, there have also been reports of CBP (Customs and Border Protection) pressuring permanent residents to give up their green card and return to their countries of origin. “For the next 90 days, nearly all travelers, except U.S. citizens, traveling on passports from Iraq, Syria, Sudan, Iran, Somalia, Libya, and Yemen will be temporarily suspended from entry to the United States. The 90 day period will allow for proper review and establishment of standards to prevent terrorist or criminal infiltration by foreign nationals. 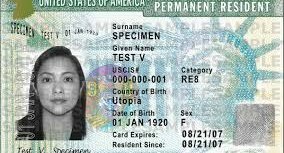 If you are a permanent resident and a citizen of one of the seven countries, you should not allow CBP to pressure you into giving up your green card. CBP agents may try to push you to sign a Form I-407, abandonment of lawful permanent resident status. As a lawful permanent resident, if the US government believes you have abandoned your green card by spending too much time outside the U.S., you have a right to a hearing in front of the immigration judge. You should ask to see the immigration judge, and CBP should parole you into the U.S. for removal proceedings. Weekend Update re: Ban on Entry of Citizens from Seven Muslim Countries and Suspension of Refugee Admissions. This is a weekend update regarding the Executive Order banning the entry into the U.S. of the citizens of seven Muslim countries: Iran, Iraq, Syria, Somalia, Sudan, Libya and Yemen, as well as suspending the US refugee program for at least four months. This past Saturday, January 28, 2017, U.S. District Judge Ann M. Donnelly for the Eastern District of New York ordered a halt to any removal of refugees or others who hold valid visas to enter the United States, in response to a petition filed by the American Civil Liberties Union (ACLU). This is only a temporary order and not a final decision. The case was filed on behalf of two Iraqis detained at JFK Airport: Hameed Khalid Darweesh, an interpreter for the U.S. military who had saved countless U.S. service members’ lives, according to Brandon Friedman, a platoon leader in Iraq; and the other plaintiff, Haider Alshawi, a former employee of a U.S. contractor in Iraq, who was to join his wife. See, Darweesh v. Trump, 1:17-CV-00480 (AMD) (EDNY Jan. 28, 2017). Shortly after, U.S. District Judge Leonie Brinkema, of Federal District Court in Virginia, issued a temporary restraining order for seven days to allow permanent residents detained at the airport to have access to their attorneys and to stay the removal of any permanent residents detained at Dulles International Airport. See, Aziz, et al., v. Trump, 1:17-CV-116 (LMB) (ED VA Jan. 28, 2017). It has been reported that CBP at Dulles International Airport was refusing to follow the order issued by the judicial branch, which is a violation of the US Constitution. This Sunday morning, January 29, 2017, U.S. District Judge Burroughs of the District of Massachusetts, also issued a temporary restraining order, ordering DHS to return to the law and regulations prior to the issuance of the executive order. See, Tootkaboni and Louhghalam v. Trump, 17-CV-10154 (Dt. Of Mass Jan. 29, 2017). The plaintiffs in this case are both professors at University of Massachusetts, and were returning to the US from an academic conference in Paris. Both professors are also lawful permanent residents of the U.S. It is reported that CBP at JFK Airport is now complying with the temporary restraining order. There are reports that CBP at Los Angeles International Airport have tried to get lawful permanent residents from any of the seven countries to sign forms abandoning their permanent residency. Fortunately, those permanent residents who refused to sign are reported to have been released. If you are a lawful permanent resident, absolutely do not allow CBP to coerce you into signing a form agreeing to abandon your permanent residency. There are reports from London Heathrow Airport that airlines are still being told by US DHS that they are to continue complying with the Executive Order and are refusing to board passengers who are citizens of any of the listed countries. Most, but not all, of the airlines flying out of Heathrow to the U.S. are complying with the executive order and refusing to board specified passengers. On the other hand, those passengers who have dual nationality and are UK citizens were being boarded. However, there seems to be a general confusion on exactly what the policy is. Please note, the above information about airport admissions is anecdotal and has not been verified. By executive order, President Trump is banning the entry of all nonimmigrants and immigrants for at least 90 days who are citizens of Iran, Iraq, Syria, Somalia, Sudan, Libya and Yemen. The only exception is for diplomats and members of NATO. This means that people who already have valid visas will not be able to travel to the U.S. for at least the next 90 days. For example, a woman who has an approved relative petition through her U.S. citizen son, and who has already obtained an immigrant visa to come to the U.S. as a permanent resident, who just happens to be a citizen of Iraq or one of the other named countries, will not be able to board a plane to the U.S. Another example, would be a Syrian student attending university in the U.S. who goes to France for winter vacation, will not be able to return to the U.S. to attend school for the Spring semester. Thus, this new order totally discounts merit or the fact that these foreigners have already cleared numerous security checks in order to obtain a visa, and still bars them from the U.S. based where they happened to be born. In addition to barring entry into the US of any persons of these nationalities, the executive order also suspends issuance of “other immigration benefits”. This appears to mean any immigration benefit, such as work authorization, extensions of stay for H-1Bs and other nonimmigrant status holders here in the U.S., approval of relative or employment petitions, etc. The executive order also suspends the US Refugee Admissions Program for at least 120 days, and bars Syrians indefinitely. Even after the program resumes, the president may ban certain nationalities from participating in the program. At this time, there are between 65 to 70 million refugees world-wide. We are facing the biggest refugee crisis since World War II. 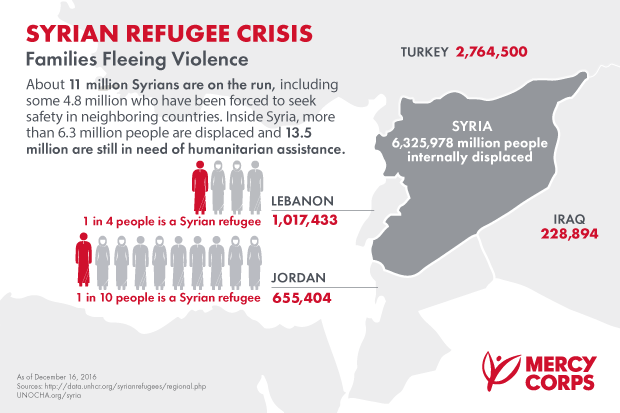 There are about 11 million Syrian refugees. There are currently more than 1.1 million Syrian refugees in Europe, and more than 2.5 million in Turkey, as well as several million others in other countries. They face unsanitary, life-threatening conditions in many of the camps. Refugees stuck in the camps on the Greek islands are literally freezing to death in frightful conditions, in tents with no hot water or heating. More than half of Syrian refugees are children under the age of 18. This is a shameful action on the part of our government, and we should all contact our senators and representatives to protest.